Flavored Milks: How Low Can You Go? Flavored milks are highly sweetened beverages made with powdered skim milk—they are actually the dairy industry’s way of getting rid of all the skim milk left over from the production of butter and cream, mostly for ice cream. Since Americans are huge ice cream eaters (and since Americans are eating more butter these days), there’s an enormous amount of this waste product that the industry needs to get rid of. With the advent of modern industrial agriculture, which separates all the farm animal species into confinement facilities, it’s no longer possible for the farmer to feed his leftover skim milk to his pigs after sending his cream to the dairy factory. So what better thing to do with this lowfat waste product than feed it to children! Because of USDA dietary guidelines, school children are not allowed to have whole milk at lunchtime—the kind of milk they need to grow normally. Instead their choices are limited to lowfat and flavored milk beverages in chocolate and strawberry flavors. These beverages contain more sugar than sodas! School students choose chocolate milk over plain milk two to one, and there are reports of children in the breakfast programs putting chocolate milk on their cereal! Thanks to the efforts of Jamie Oliver, host of Jamie Oliver’s Food Revolution, plus input from thousands of concerned parents, many schools dropped the flavored milk offering. Because the kids hate the watery plain lowfat milk, they ended up not drinking milk, and the dairy industry was not pleased, especially as some policymakers began calling for the introduction of full fat milk at school lunches. A few years ago, when researching the subject of flavored milk for a presentation on school lunches, I was astounded to find three web pages dedicated to hawking flavored milk. 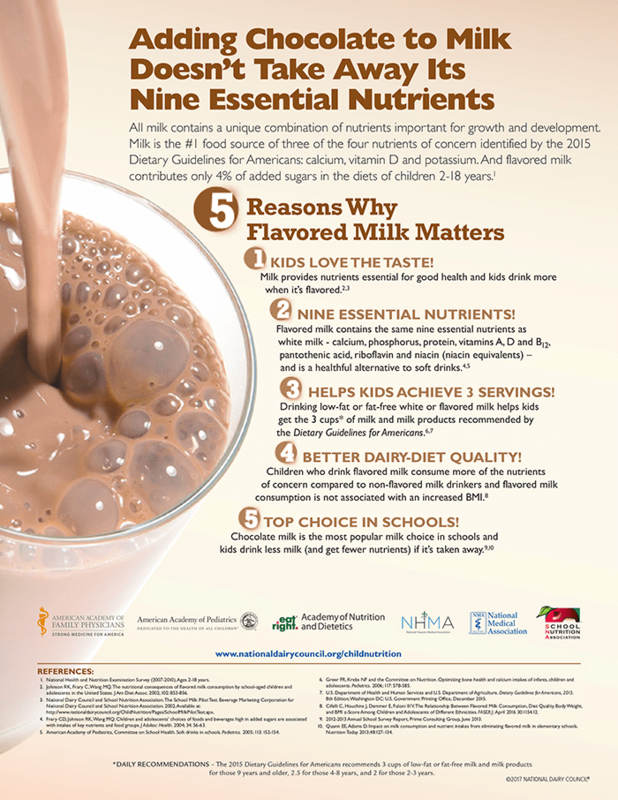 Typical arguments go like this: “Flavored milk is a terrific way for kids, teens and adults to enjoy milk and get the same nine essential nutrients found in milk — nutrients that can help kids grow into strong and healthy adults. So why isn’t flavored milk a good way to get the “three out of four” important nutrients in milk. Since the milk has been heated—once for pasteurization and again for the powdering process—any enzymes that help the body absorb calcium and phosphorus will be destroyed. You need vitamin D to utilize calcium and phosphorus but it is unlikely the vitamin D will be absorbed since it is a fat-soluble vitamin, and there is little or no fat in the flavored milks. These flavored milks typically also contain corn starch, carrageenan (hard to digest), natural and artificial flavors and vitamin A palmitate. Strawberry-flavored milk labels list high fructose corn syrup along with sugar, plus natural flavoring and red dye—but no strawberries! Abbey looks nice and slim, as she should, engaging in so much exercise. But on the opposite page we have two group photos of the State Dairy Princesses—the outgoing winners and the incoming winners. Recently at a dairy conference I attended, a dairy farmer who was promoting whole milk for school children pointed out that all six of these teenage gals are. . . overweight, some quite a bit so. The dirty little secret of these flavored milks is that they provide the perfect combination of ingredients for weight gain—in spite of industry claims to the contrary. First is the low-fat powdered milk. If you feed low-fat milk to pigs—who have a metabolism similar to that of humans–they will rapidly gain weight, but they will stay lean if fed whole milk. It seems counter-intuitive to many, but readers of this blog know that we need those animal fats to stay slim. 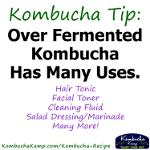 They provide energy, support thyroid function, help with detoxification (so those toxins won’t need body fat to lodge in) and contribute to satiety. Then we have the sugar, or combination of sugar and high-fructose corn syrup. The added sweeteners in one serving of flavored milk add up to twenty-five to thirty grams—thirty grams is two tablespoons. If this added sugar contributes only 4 percent of sugar intake in children ages two to eighteen, then these kids are eating a heck of a lot of sugar. . . maybe because flavored milk leaves them so unsatisfied. There’s a third ingredient in flavored milk that can cause weight gain. . . can you guess what it is? The answer is free glutamic acid (basically MSG) formed during the milk powdering process, and also lurking in the artificial and “natural” flavors. Researchers use MSG to induce obesity in test animals. And a study at the University of North Carolina found that “people who eat more MSG are more likely to be overweight or obese”, no matter how many calories they consumed overall. Here’s a good explanation of how MSG disrupts the human metabolism to cause weight gain. The fact that spokespersons can promote these food-like products is an indictment of the whole dairy industry. They are absolutely not appropriate for anyone, especially growing children. What kind of society believes that it is a good idea to feed such garbage to children, and what will become of it in future generations? The Weston A. Price Foundation promotes healthy, stable, nutrient-dense animal fats as the key to weight control and optimal health. Your membership supports the work we do. “… USDA dietary guidelines ….” are another good reason to home-school children or at least give them a home-made lunch.